This experimental and vibrant workshop is perfect for those with an interest in surface design and textiles. 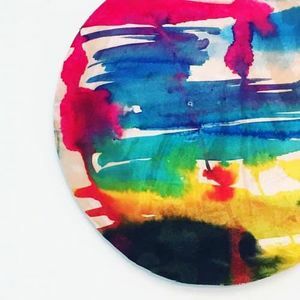 Using heat reactive dyes playfully painted onto paper we will bring synthetic fabric to life with the heat press. Objects such as feathers, leaves, stencils, threads, doilies we will build up exciting patterns on fabric. Participants will leave with a variety of unique fabric samples.